Discussion in 'General Discussion' started by Mick West, Aug 20, 2015. In the last week the seems to have been a flurry of sighting of strange beams of light in the sky. 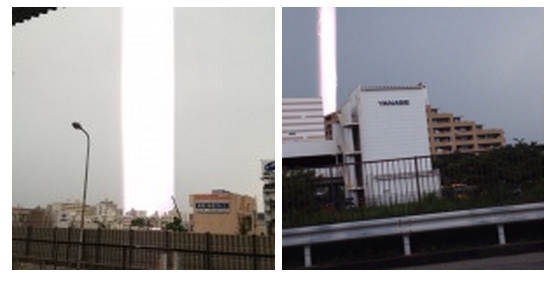 The majority of them were quickly identified as camera glitches caused by the rolling shutter just catching a strip of a scene illuminated by a flash, leaving the rest with normal illumination, which gives a "beam" effect. But why were there suddenly so many? Had something changed? 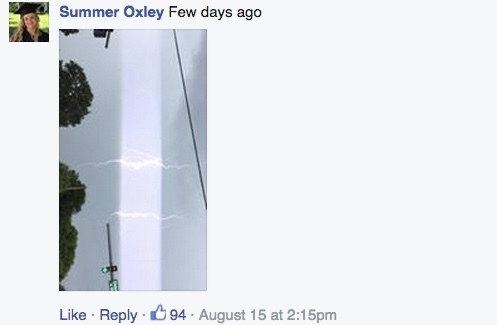 Was there more lightning? An update in iPhone software? A transdimensional rapture portal opening in the fabric of the universe? None of the above. It turns out the reason we are suddenly seeing so many is largely because one of the photos went viral, and the rapid spread of this photo across the internet led to people posting photos of what they might other have discarded as a messed up photo. But it mostly led people to remember photos they took quite some time ago, and so they posted (or re-posted) those photos, and they seem "new". The photo was taken in 2009 by Hector Siliezar. For some reason it did not get much attention until 2012, when it went viral to a degree - first being published in the web site "Earthfiles", and then getting picked up by various other sites. But the phenomenon faded away, until August, 2015, when we got the image in the animation above. This was shared over 14,000 times. 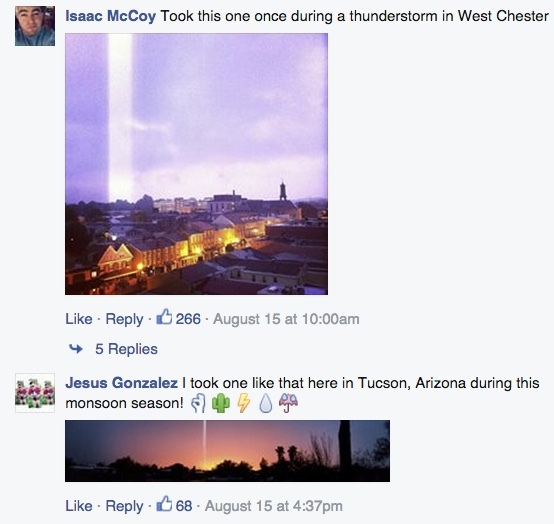 The next day it was shared again by NBC2 News, and re-shared another 17,000 times. That same day (the 15th), the image was posted on Imgur, and then shared on Reddit. Over the course of a few hours, the image made it's way to the front page of Reddit, and then to the #1 position, where it stayed for a good portion of the day. 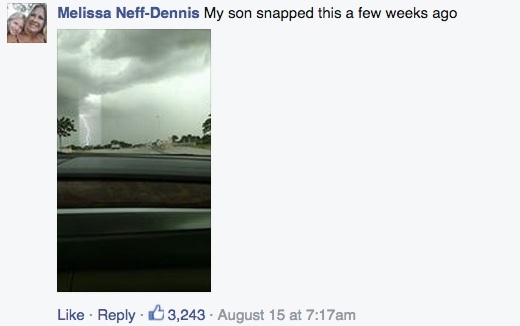 The Imgur post was viewed over three million times, largely via Reddit. How can we gauge how much Reddit played a part? 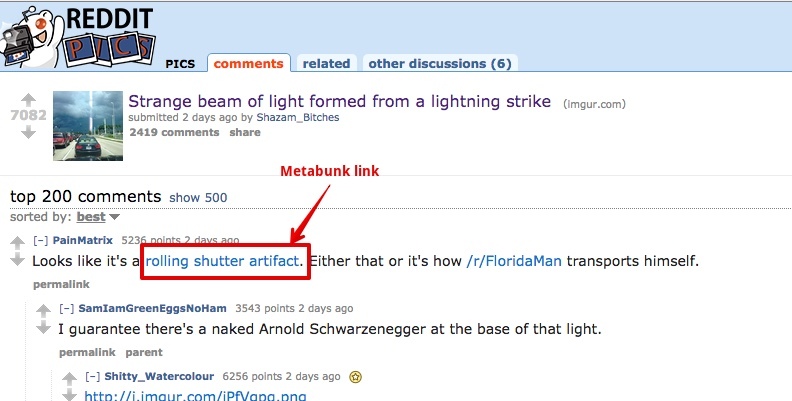 Partly by luck, one of the first comments on Reddit contained a link to my thread about the Mayan pyramid beam. 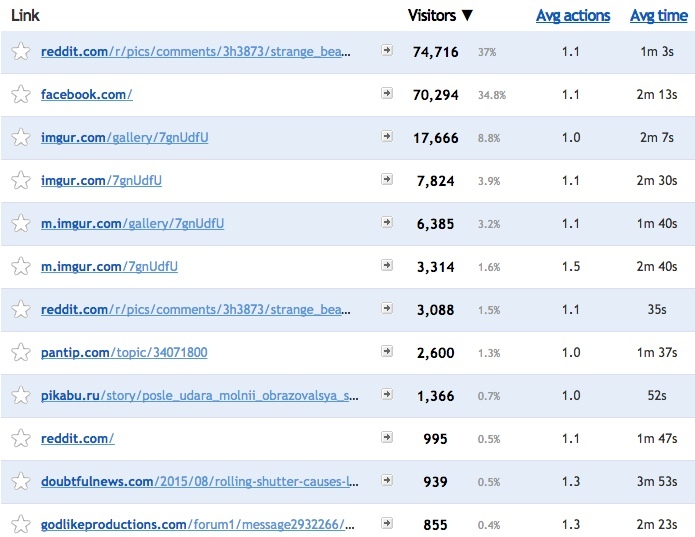 Over 80% of the traffic coming from Reddit that day, and less than 10% from Facebook. 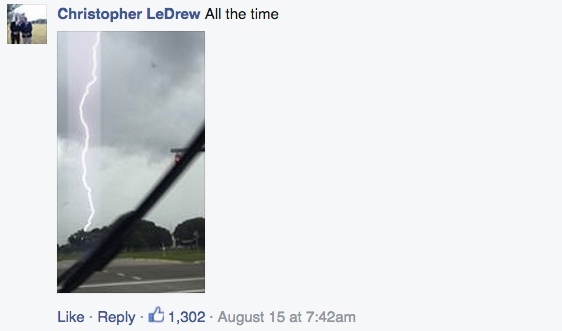 And that's just in the top 50 of 4,000 comments. 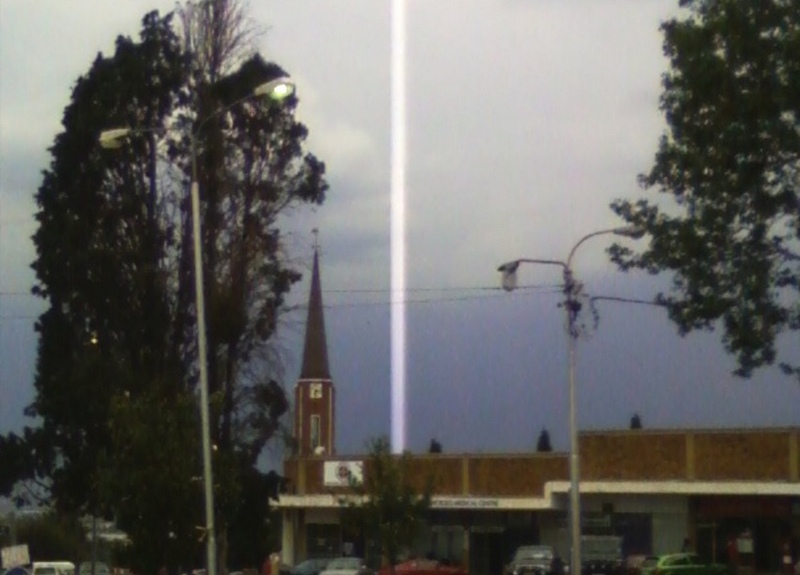 So it's not that these beams have suddenly started to appear. It's just there's been a big spike in public interest due to one photo, so people posted their own photos (often taken months or years ago), and that created the artificial impression of a sudden increase in the number of such photos. 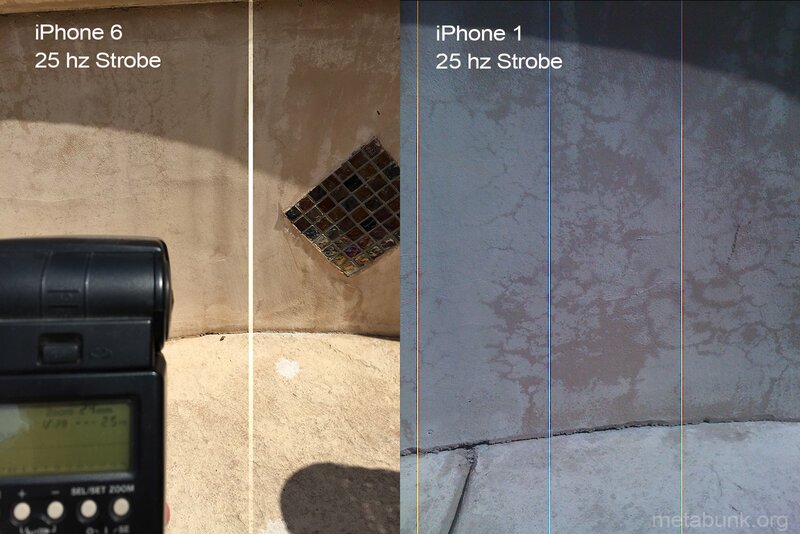 The more modern phone gives the distinctive "beam" of illuminated photo. The older iPhone 1 (from 2007) just gives individual lines that are corrupt color, with no detail. The fact that there's three of them indicates that it's only exposing a few lines at once, and is taking about 1/6th of a second to expose this scene in bright sunlight. So at some point between 2007 and now, the iPhone camera (and phone cameras in general) became capable of capturing this type of thing. The Mayan temple example is (supposedly) from 2009, and there are very few from before then. So while it's not sudden, it did only start a few years ago. I like the explanation. Here is a webcam image with clear skies projecting similar beam, Found on Youtube.
. Is that the sun looks kinda small. 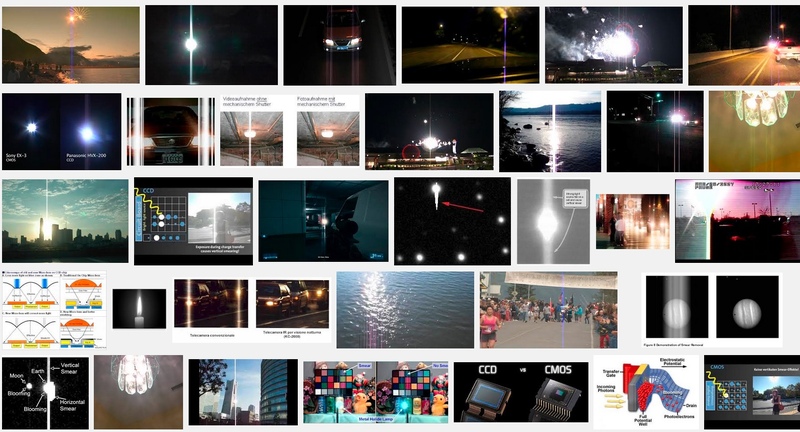 It's an effect when the pixels in the sensor are exposed to too bright a light (like the sun), and the light overflows from one pixel to the next, often affecting a whole column. It happens more on cheaper and older sensors. Looked it up...very interesting. Thanks for the reply. It's the green tennis shoe effect. Something I explained to my Stepson when he bought a pair of green tennis shoes. He said, "No one was wearing green tennis shoes until I bout them. Now everyone is wearing them." Then I had to explain to him that they were always wearing green tennis shoes but he hadn't noticed until he bought a pair. Not to long ago he bought a red Rav 4 and I heard him explaining the "Green Tennis Shoe" effect to my granddaughter. video 2 the flash is obvious but the lights at .10 ? the videos last less than 15 seconds. Would like to get your opinion if you don't mind. That's rather a meaningless claim without evidence. Also seems a bit off topic. 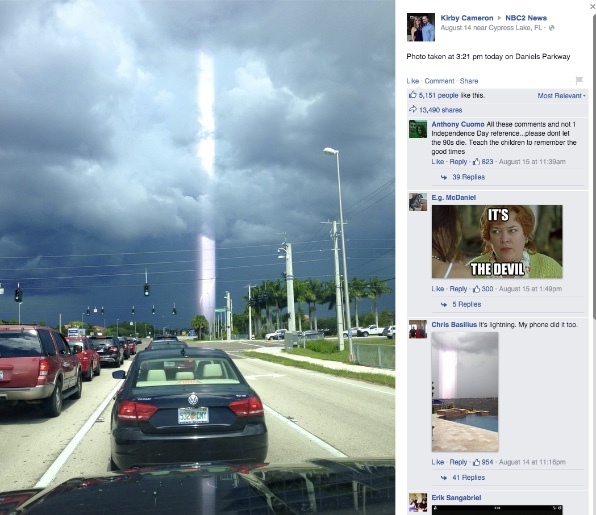 Is it anything to do with the beams of light? About 3 years ago, in Wenatchee Washington I saw probably 11 or 12 giant columns of light, probably 30 feet radius, emitting from the sky. It was late, I think around midnight on a cold, but not below freezing, very cloudy night, the kind that make it seem almost day time because it's so light out. I was with a friend of mine who also saw them but unfortunately we didn't have a charger for our phones and both our phones were dead. I tried calling my mom to tell her and after it happened it was like I forgot completely about it until just recently. To be honest it scares me, because I know that I saw these pillars with my own eyes and I can't identify what or who was shining the light or what was the purpose of these light beams? My friend and I went to see where the lights went to investigate, we love adventure......we couldn't ever get to it, but it was definitely coming down from the sky but with the thick cloud cover nothing else was visible. There was no lightning storms, it was like it almost wanted to snow. The city was incredibly quiet that night and the beams were completely silent. I don't know how long they were visible for but we sat and watched in disbelief for atleast an hour and looked for the source for atleast a good 30 mins or 45 mins......they didn't appear to be targeting anything in particular, but sparatic all over east Wenatchee and Wenatchee, not on the mountains but in the valley. 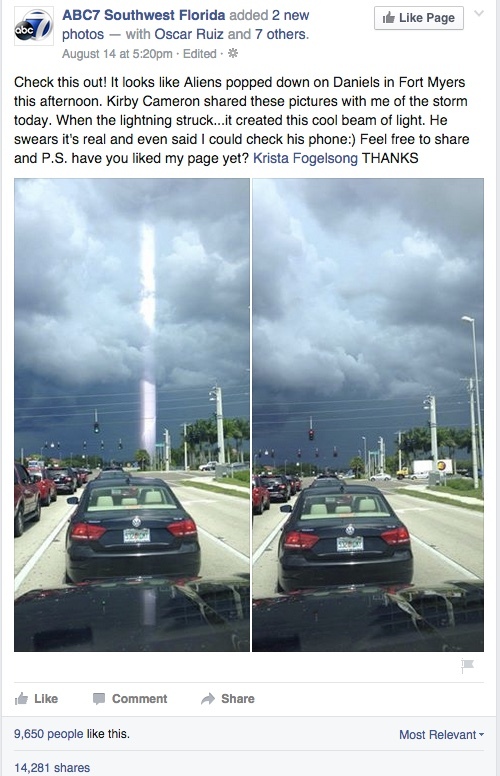 It was something I can't figure out, and I know it was not a trick of the lens because I didn't take pictures, but they looked like the beam from the pyramid and the one in the road. The pictures from the sun you can see the sun's beams and they are very beautiful.....but nothing like the beams of light I saw that night. could you have been facing seattle? real solid looking like these? or more transparent? Do you think they were coming from the sky itself because they didnt reach the ground? 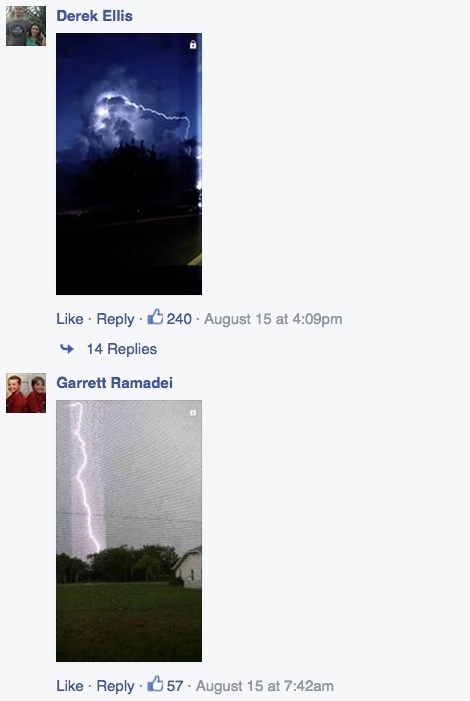 In the other thread you said they looked more like the photo of the lightning than the Rolling shutter photos? 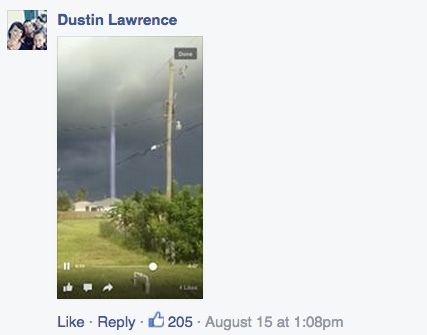 So they looked like beams rather than forks of lightning? I'm thinking light pollution on low cloud cover. 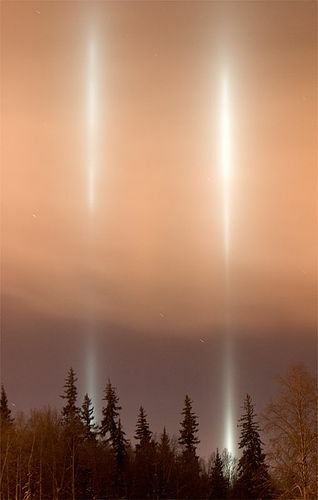 Could they have been light pillars? I took this from my back door around December 28th in Winnipeg, Manitoba. The city was absolutely surrounded by these lights for about 3 days...very cool to see. However, when I saw them I immediately knew that this phenomena would show up on the YouTube conspiracy/ufo channels(such as secureteam).....and of course they did. This is such a common occurrence so it's strange to me that people are acting like this is a brand new thing. I have 2 photos taken 3 years apart, on disposable cameras, a Fuji and other Kodak, indoors, same house, 2 different rooms, both images are of my youngest child, both have a bright beam of light next to her on her right. Taken in the day time. The rooms were strangely dark in the image. 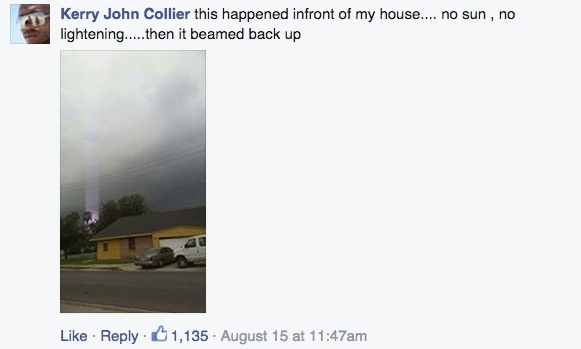 I have never seen a photo since of this light beam taken indoors. This appears to be a hair very close to the camera illuminated by the flash. I have never seen a photo since of this light beam taken indoors. I just took these photos holding a few hairs (from my head) in front of my iPhone with the flash on. Resembles the images taken outdoors as well, the father of child in image took one, and sibling took the other. The hair does resemble this light, but does not explain the darkness in both rooms that should be sunlit otherwise. It probably just exposed as dark because you used the flash. 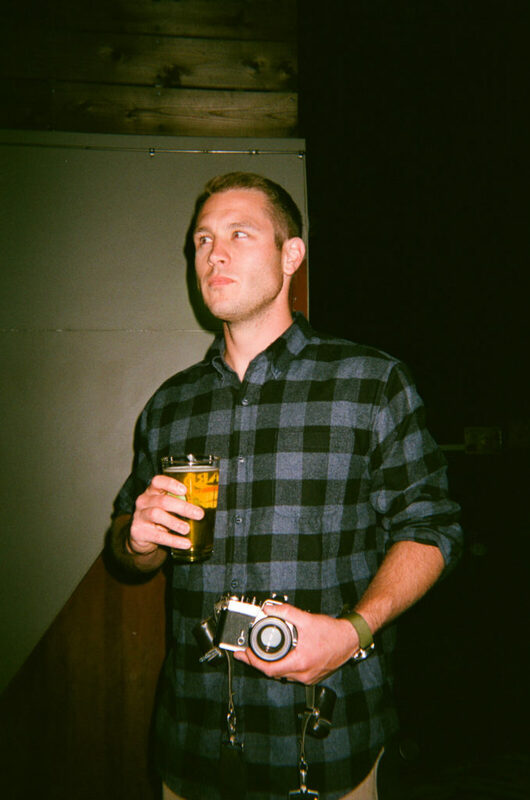 Disposable cameras have a weak flash. So you get the dark corners. Example from Fuji disposable camera. Yeah you would fully expect that in a sunlit room when using the weak flash that the camera would expose for the flash which is only capable of illuminating the subject and the rest of the room would be darker. You can see some flash bounce from the white cabinets in the top photo.